Stop what you’re doing! Seriously, stop right now and get on your computer – oh, I guess you’re already on it. Ok then, leave this page and immediately book a trip to Salento, Colombia. You can fly into Periera or Armenia (yes, Armenia, Colombia) or, if you want, you can fly to Medellin or Bogota or Cali and take a long, curvy bus ride. Following the long and winding road I took from Medellin to Salento, and after finally arriving at the Eco Hotel La Cabaña, I enjoy a brie, apple and prosciutto sandwich while sharing a bottle of wine with the French family staying in the room next to me. They’ve also arrived today but, as they came earlier, they’ve taken a dip in the river behind our house. We’re all hungry and the owner’s daughter, Maria Camila, has brought us dinner to enjoy on the porch in front of our rooms where we chat about our Colombian adventures thus far and our plans for the next couple of days. 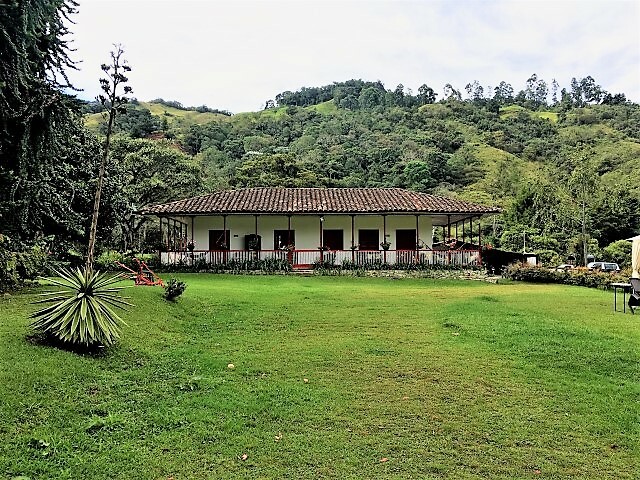 The Eco Hotel La Cabaña consists of two houses across the street from each other with a combined total of nine rooms accommodating 26 people. As I settle into my room, a few flying creatures welcome me. This is a leche finca or dairy farm, and, though only a five-minute drive from the town, it’s still in the countryside and, though there don’t seem to be mosquitos, there are moths and other random bugs. This is no reflection on the cleanliness of the place, it’s just my room has lights and these types of insects are attracted to them. After unpacking and catching up on the news (yup, it has cable TV), I settle under my down quilt for a good night’s sleep. When I awake in the morning I don’t want to get out of bed. It’s a bit cool, not cold, but after the heat of Cartagena, the change in temperature (low-60’s Fahrenheit in the morning) is a shock. Climbing out of bed, I open the curtains and consider the possibility that my bus through the Andes might not have made it to its destination safely and I may have died and gone to heaven. The daylight allows me to see what I couldn’t last night; large black and white cows roam the pasture just outside my window chomping on perfectly green grass looking as content as I feel. I dress and walk outside, immediately hearing the splash of the gently rolling river behind the house. I now get my first real look at the two houses of the finca. The white buildings with red trim are built in the local style with railed porches surrounding the entire structure and which remind me of the Antebellum homes found in the southeastern United States. Walking over to the main house I say hello to the very friendly and very-well taken care of dogs who belong to the ranch owners and some staff before settling in a seat in the small dining room where I meet some more fellow travelers and staff. Breakfast is fresh fruit, tamales, eggs, toast, homemade cheese from the cows on the farm (well, the cows didn’t make the cheese, but they did supply the milk and the farm staff made the cheese), juice, yogurt (the yogurt in Colombia is in the form of a drink), and, being in the coffee region, coffee is available 24-hours a day. 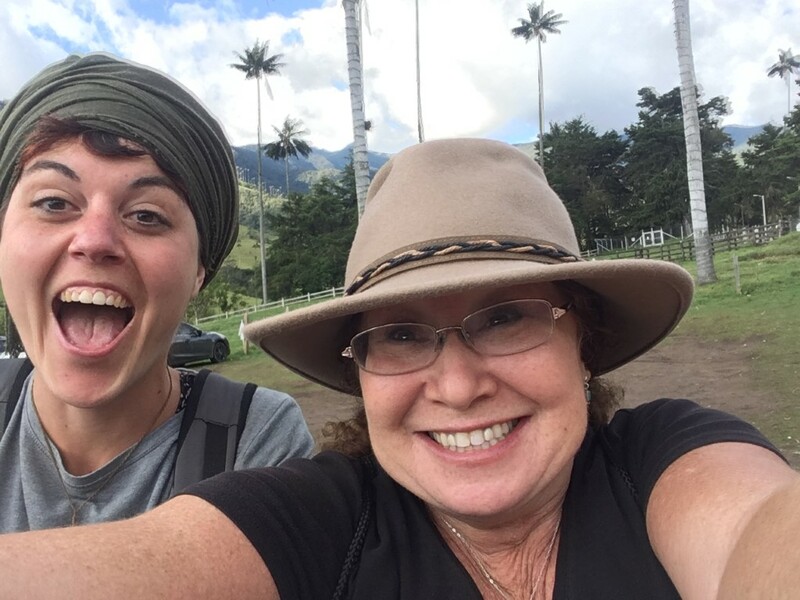 During breakfast, I speak with Maria Camila about the options of activities here and, as the weather is nice today, both Maria and I decide it’s a good day to hike the Corcora Valley. 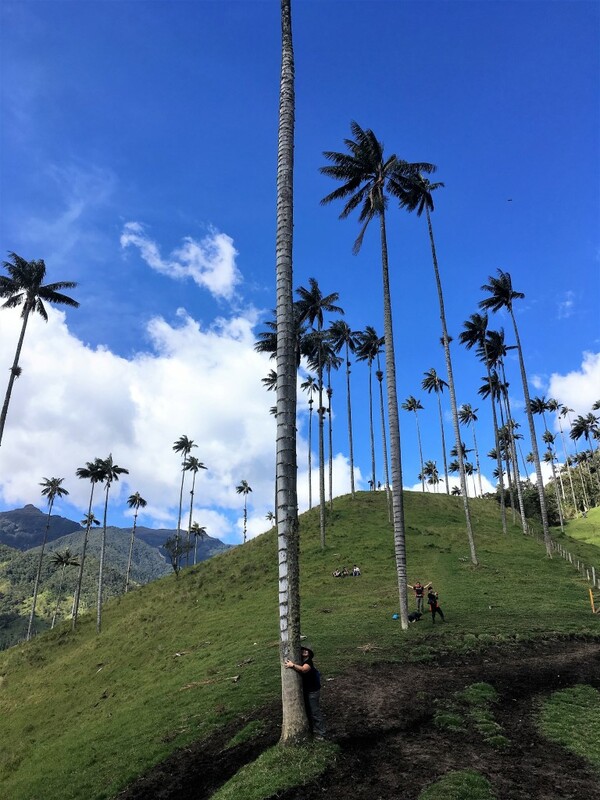 The Corocora Valley is part of the Los Nevados National Natural Park and is known for its Quindío wax palm trees which, growing as high as 150-200 feet (45-60 meters), are the tallest palm trees in the world. It’s also filled with other incredible flora and fauna, as well as lots of mud. 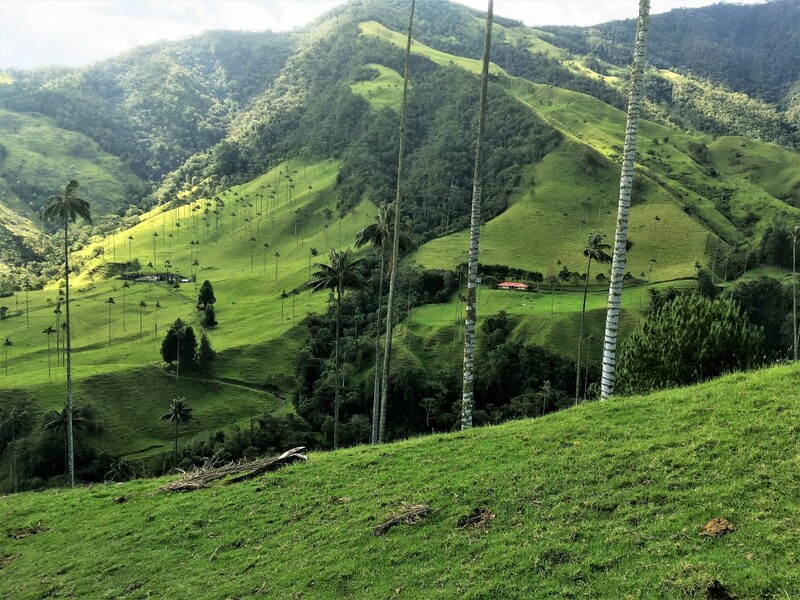 There are a few ways to see the Corcora Valley. 1) You can drive there and enjoy lunch, coffee, or a beer while contemplating the incredible scenery. Oh, and by drive I mean you catch a ride on one of the many Willys. 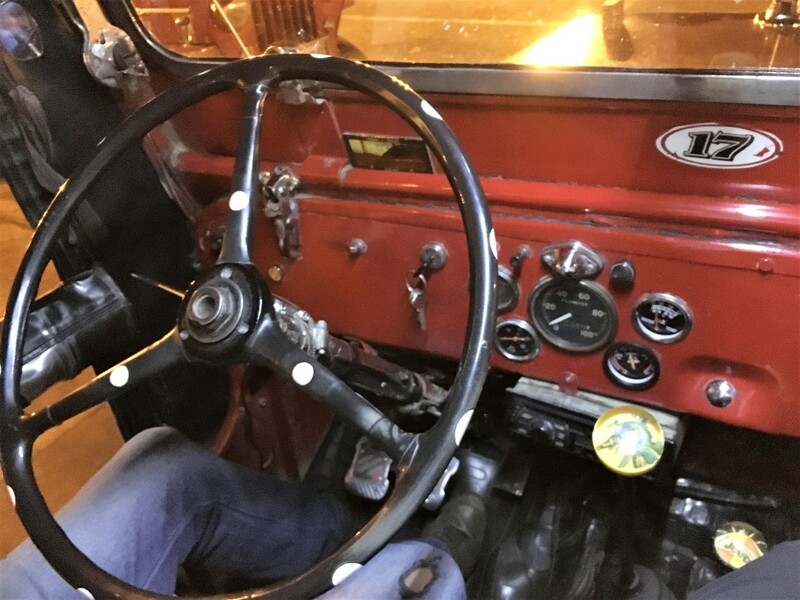 These Jeeps, which were left over after World War II when the U.S. government no longer had a need for so many, found homes in the coffee region of Colombia. 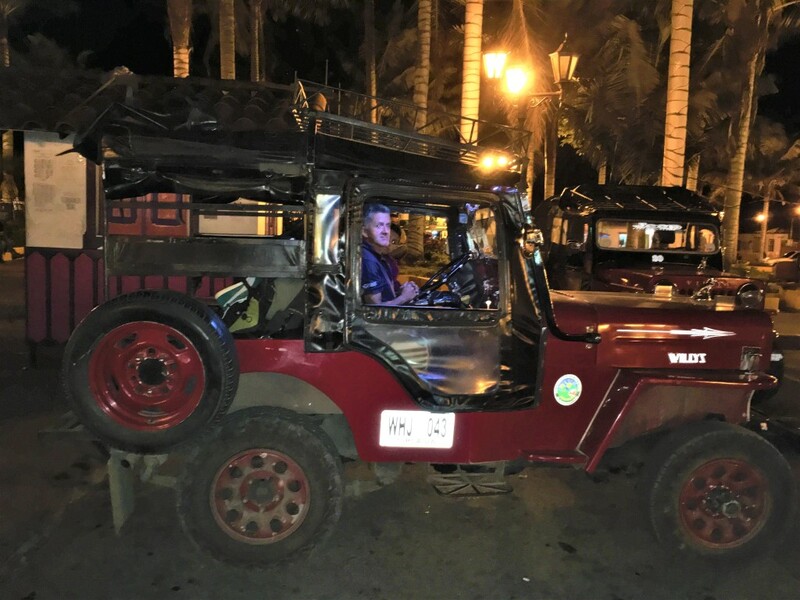 These workhorses are normally outfitted with some bench seats lining the sides of the back and can carry up to 10-or-more people using the front and back seats, as well accommodating four people standing on the back bumper while holding onto bars on the roof. 2) Grab a Willy to the entrance and take a 2-hour hike into the Valley. 3) Grab that Willy (wow, this is beginning to sound dirty and perhaps you should do that in private) to the entrance and take the 4-6-hour hike through the jungle, up the mountain (up even further if you want to go see the hummingbirds and parrots), and then down into the Corcora Valley. Choosing option number 3, I grab my Willy (wait, do I even have one of those?) and head off. Okay, I’m better now. On a normal day, I could wave down a Willy with an empty seat, or back bumper to climb on and bring me to the hike. Unfortunately, today is a holiday and many Colombians have come to the area for the long weekend. (I’ve been here for three weeks and this is the second holiday, though I don’t really understand what either holiday has been about.) 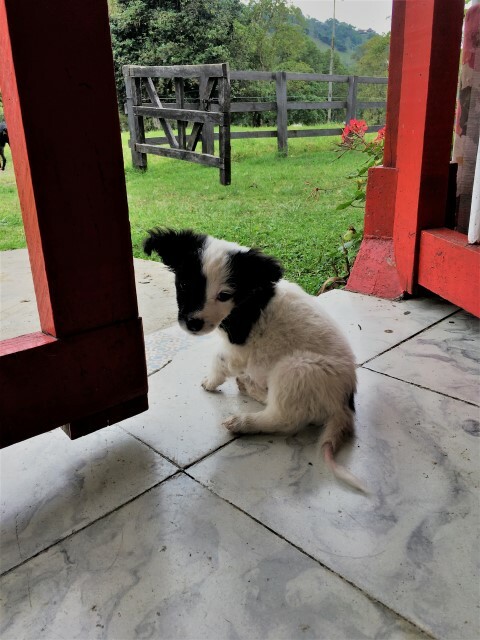 Maria Camila calls a Willy for me which, as it’s now private, costs me 10-times as much as a shared one would (COP31,000 versus COP3,100 or about US$10.00 versus US$1.00). I arrive at the park about fifteen-minutes later and find my way through the blue gate to begin my hike. I’m told the hike is well-marked and I shouldn’t have a problem with getting lost. I later find this to be true as I get lost without any problem. Before long, I arrive at a small wooden structure next to which stands a man pointing to a map painted on a wooden sign. He’s giving instructions in Spanish and eight or ten people from various countries who don’t speak Spanish are nodding their heads pretending to understand. The man collects our COP2,000 entrance fee and we move on. 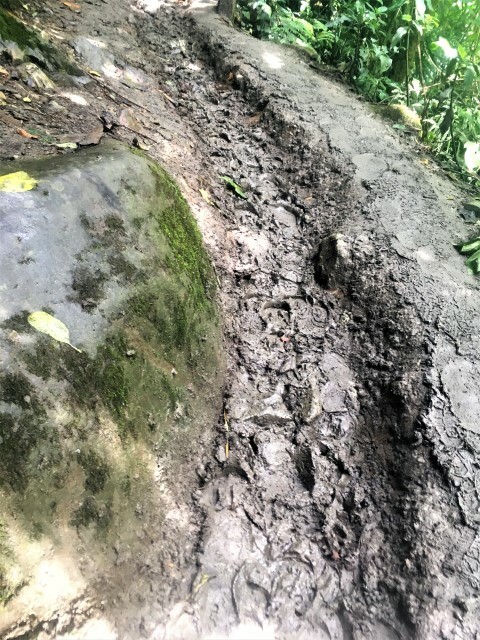 I slide along the muddy trail thankful for my waterproof hiking boots yet, as good as the traction may be, I still manage to accomplish pratfalls which leave my pants, shirt, and hands a healthy shade of brown. 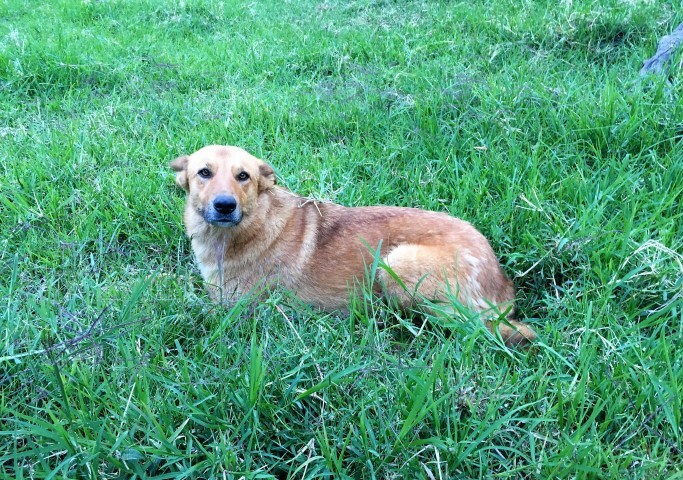 (It’s my own personal mud bath.) 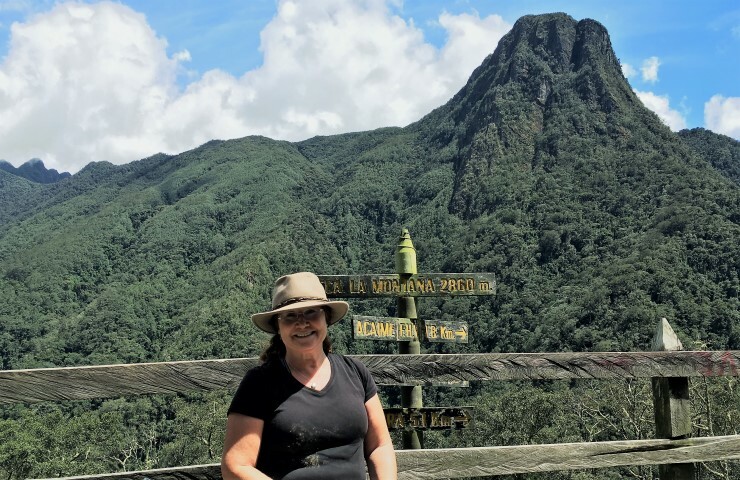 The trail winds through the jungle, up hills, and across a multitude of footbridges made from wood planks and wire which bounce and sway as I walk across. Being sure to wait for the person in front of me to exit before taking careful steps to balance on the wood while touching the thin wire along the side, I quickly learn not to grab the wire as some connecting areas on the bridges and many areas along the trail are linked with barbed wire. 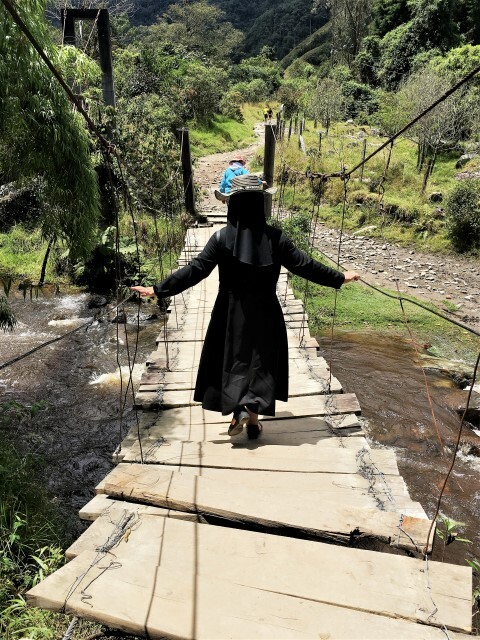 At the first bridge, I wait for the habit-covered nun in front of me to cross. She stops for a moment before stepping on the bridge. Touching her head and chest, she first crosses, and then she crosses. I continue on, meeting travelers from all over the world – lots of French and Israelis – slogging through mud, up and down hills (though mainly up), and crossing questionable bridges. 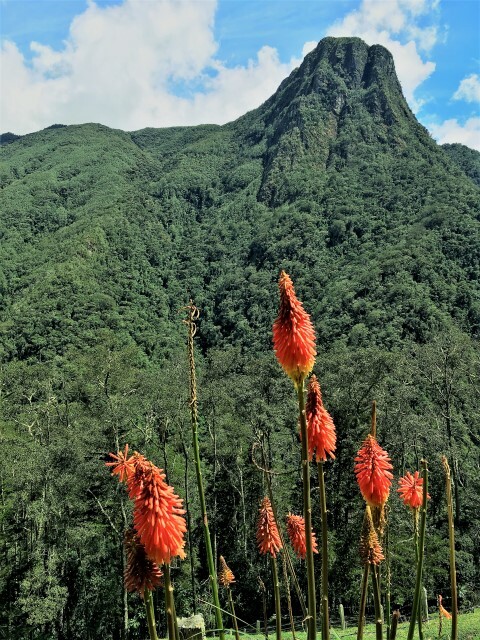 I’d already decided not hike up to the birds as I had my fill of Hummingbirds in Minka and, as they surrounded my hotel verandah, I didn’t have to hike uphill for an extra half-hour to see them. Though I was told the trail is clearly marked, there aren’t really any signs and, at the few intersections I come to, it’s a choice of one muddy trail versus another. Still, hikers help each other along the way to find the correct path. The last forty-or-so minutes are strictly uphill. Eventually, I come to a clearing which allows me to see a series of switchbacks climbing the side of a beautiful green hill. Taking a break every twenty steps, I finally crest the hill where I find grateful people happy to have reached the top and enjoying just breathing while sitting on benches or lying in the grass. The sunshine and incredible views give us renewed energy while everyone refuels with snacks they’ve brought. Joining in, I take a half hour to simply breathe. Eventually, I do arrive and have a coffee at the small indoor/outdoor restaurant while sitting on a bale of hay and chatting with some locals and travelers. I walk over to the parking area and grab a Willy with one extra spot for me on the back bumper. I stand with three other women and, buzzed on adrenaline, we’re all feeling powerful after our hike and enjoying the wind combing our hair while traveling through the picturesque countryside. Fifteen-minutes later, I jump off the bumper, pay the driver (only 3,100 this time) and head straight to the shower. Now, what the hell are you still doing here? Book a trip to visit this paradise of Salento and the surrounding region right now!